Gov. Charlie Baker's administration is citing progress in overhauling the state's troubled child welfare agency as officials say the caseload for overburdened social workers remains too high. The administration on Monday said the Department of Children and Families has implemented a series of reforms and added 170 new employees, including social workers, since July 1. The Republican governor has asked lawmakers for a $30 million boost in the agency's budget for the next fiscal year. Officials say average caseload remains above the maximum target of 18 children per social worker. 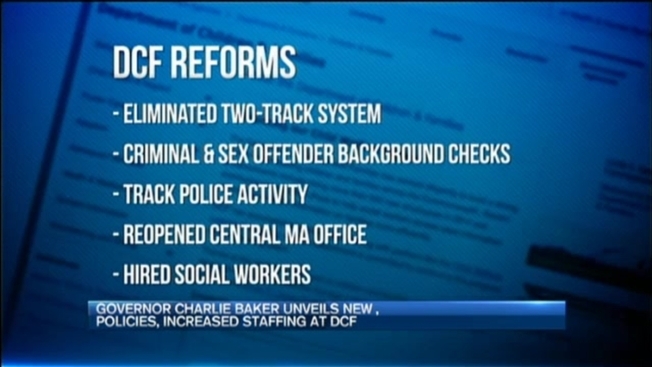 The head of the union representing social workers, Peter MacKinnon, said after a meeting with Baker that the state is making progress in confronting issues facing DCF, but the improvements still represent "the tip of the iceberg."